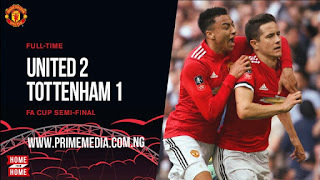 Manchester United 2 – 1 Tottenham Hotspur – Ander Herrera’s second-half strike sent Manchester United into the FA Cup final at the expense of Tottenham. 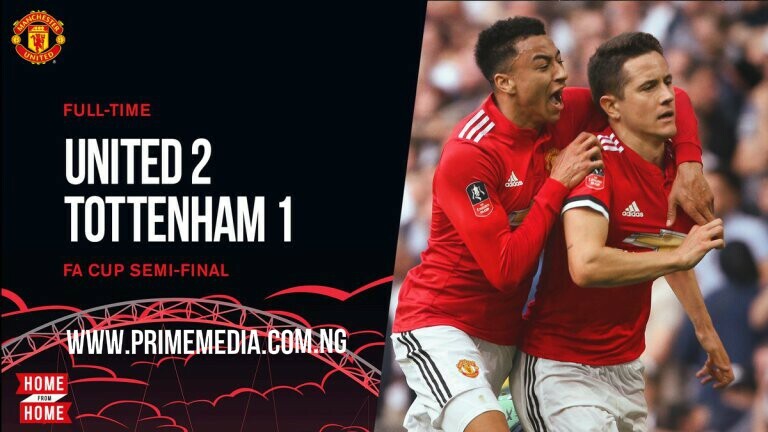 Manchester United came from behind to beat Tottenham 2-1 at Wembley on Saturday and secure their place in the FA Cup final. Ander Herrera struck the winner midway through the second half, after Alexis Sanchez had cancelled out an opening goal from Dele Alli. United lost on their league visit to Spurs this season after falling behind to an early goal and it looked like Mauricio Pochettino’s side could repeat the feat when Alli turned home Christian Eriksen’s cross. This time, however, Jose Mourinho’s men responded, with former Arsenal star Sanchez scoring for the eighth time in eight appearances at England’s national stadium to draw his side level. With the match finely balanced, Herrera blasted home following a quick United break forward to hand his side victory in their record-equalling 29th semi-final and secure a showdown with either Chelsea or Southampton. The defeat ends Spurs’ hopes of silverware for another season and means they have now lost eight times in a row at this stage of the competition. Spurs led after 11 seconds of their Premier League win over United at Wembley in January, and they needed only 11 minutes to go 1-0 up on this occasion. Eriksen raced onto a long ball down the United left, with Ashley Young caught well out of position, and he crossed for Alli to tap home on the stretch at the far post. Mourinho looked a frustrated figure on the touchline, but his team got the response they needed 24 minutes in, when Paul Pogba, having robbed Mousa Dembele near the Spurs box, curled in a fine cross from the left that Sanchez headed past the static Michel Vorm. The hectic early pace began to drop towards the end of a very balanced first half, although Pogba had a dipping effort tipped wide by Vorm and Eric Dier’s low drive smacked the base of the left-hand post after taking a deflection. It was United who made the most of the next good chance, though, 17 minutes into the second half. Sanchez gathered the ball down the left and squared it to Romelu Lukaku, Jesse Lingard let his pass run and Herrera drilled beneath Vorm from the edge of the area. Mourinho’s side threatened to move two goals clear, with Vorm saving well from Pogba and Lukaku, before dropping deep to keep Spurs frustrated in the closing minutes and send the travelling fans into raptures at the final whistle.